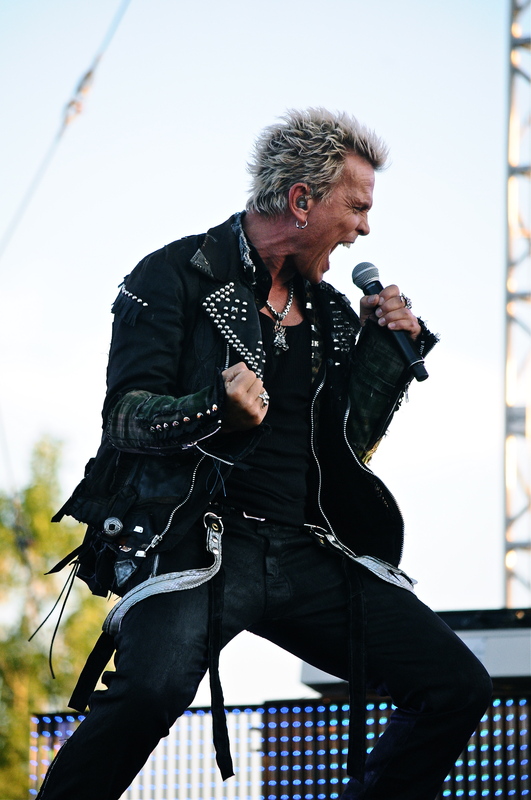 Summer was gladly welcomed this past Tuesday as the 2013 summer concert series at Artpark kicked off to a wild start with pop rock icon Billy Idol leading the festivities. Not knowing what to expect on first arrival, the mood was set to rest as the weather was more than fitting for the first summer concert of the year. The venue itself also deserves credit for providing a visually serene concert setting complete with mountains and majestic outdoor scenery, which the artists themselves always seem to enjoy. Billy Idol entered the stage with a running start as the first tracks of the night, Generation X classics “Ready Steady Go” and “Dancing With Myself” immediately sent the packed crowd into a frenzy. Right from the start it was evident that many knew of Idols previous band, and luckily “Kid Rocker” was also represented in the abrasive 17 song set. Guitar virtuoso and Idol’s right hand man, Steve Stevens, proved his place in the world of “guitar shredders” as he controlled the stage with his excessive amount of elaborate guitar changes and pure talent throughout. Camp Freddy founder, Billy Morrison, joined Stevens on guitar duties and looked as though he was having a blast. The band is rounded out with bassist Stephen McGrath and drummer Jeremy Colson, holding down the low end and keyboard player Derek Sherinian. The current band is tight, enthusiastic and talented all while providing an energetic and fun filled show. That being said, Stevens and company in no way over shadowed Idol, the punk pioneer who seemed extra energized from start to finish. Whether it was the scenery around him or the crazed reaction from those in attendance, Idol seemed mesmerized and entertained himself as he joked with the many females pressed against the barricade throughout the almost two hour affair. “Pumping On Steel” and “Flesh For Fantasy”, provided an opportunity for Idol to interact as items were presented for autographs during flirtatious moments of the back to back songs. The song of the night just might have been “Postcards From The Past”, a new track which may be an indicator to where the band is headed musically. The only low point, if there was one, may have been the three song ballad barrage which seemed to drag a bit and concluded with hit “Eyes Without A Face”. The momentum was eventually picked back up with rockers “Blue Highway” and set staple “Rebel Yell”. An acoustic start to “White Wedding” was accompanied by crowd participation before Stevens broke into the solo break and the rest of the bandjoined in to finish it off. The set closed with “Mony, Mony” Idol’s highest charting song and lone number one hit. The band stepped on the front lines to take their bows and say their farewells. Still sporting bleach blonde hair and tight leather pants, Idol looked healthy and his voice still sounded as good as it ever has. The constant interaction with both his band and the fans made it very apparent to everyone that he loves what he does and will hopefully continue to perform and release new music until he no longer can. Warming the crowd for Billy Idol is no easy feat but openers Tyler Bryant And The Shakedown, almost immediately won over those who arrived early for a decent spot by the stage. With their glam rock influences, the four piece group has the charisma and attitude it takes to be on stage and present their unique version of rock and roll. The band, led by Bryant, also featured guitarist Graham Whitford, son of the legendary Brad Whitford of Aerosmith.